If you’ve been following my posts recently, you already know I’m suffering from severe emerald green obsession. I can’t stop looking for new ways to incorporate it into my wardrobe! This gorgeous, versatile color is perfect for any occasion AND is a hot fashion trend for spring… which is why I’m featuring it in this week’s post! 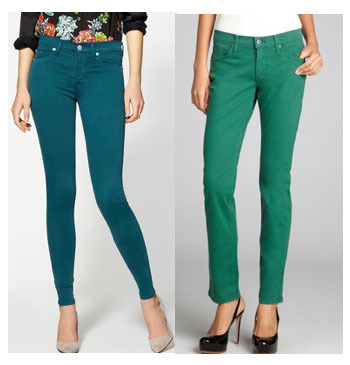 Today, I’ll show you how to style a pair of emerald green jeans, which are a total must-have for Spring 2013. If you already have a pair or if you’re just looking to get inspired, check out the outfits and styling tips below. 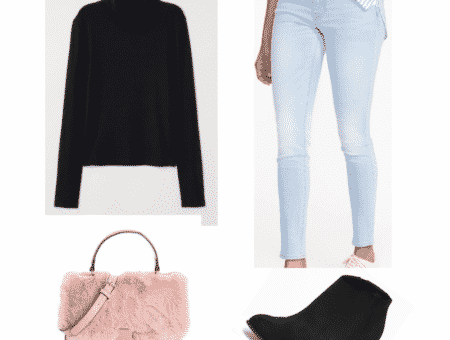 Create a relaxed yet chic look for class by pairing your jeans with an oversized black sweater. The dark top creates bold contrast, bringing out the fierce jewel tone of the jeans. Next, add tall black riding boots and a printed scarf (I’m obsessed with scarves that look like maps and flags) to soften the look. Add edgy flair with a stack of silver spiked bangles and sparkly shield-shaped studs. Complete the look by adding a little more color with a warm, blush-toned shoulder bag. 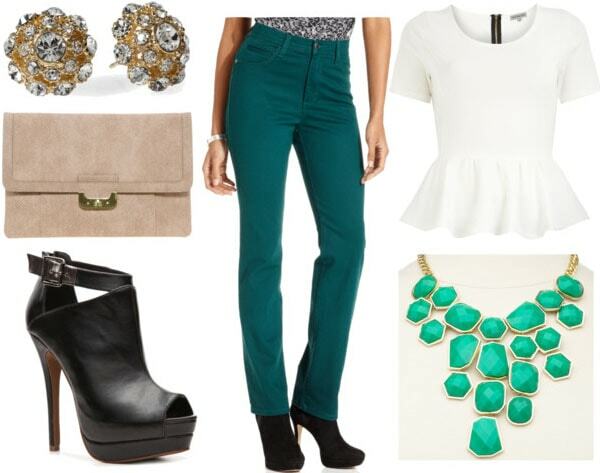 Keep the focus on the pants for your night look by pairing your jeans with a white peplum top. Amp things up with a bold bejeweled statement necklace in a glamorous lighter green shade. Accessorize with fashion basics like black peep-toe booties and a neutral beige clutch. Complete the look by adding a touch of sparkle with some crystal-embellished gold studs. Have you incorporated emerald into your spring wardrobe yet? What do you think of the outfits? 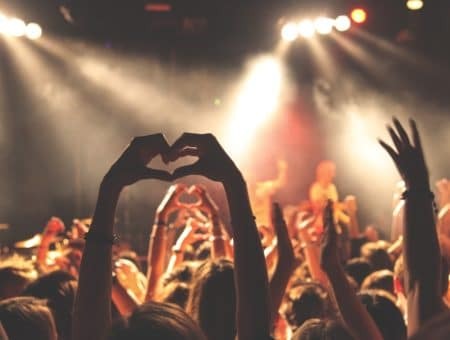 Be sure to leave me a comment and let me know what you think – I love hearing your thoughts!